Butterfly Lullaby is an enchanting faerie story about a little Butterfly Faerie called Princess Melody. A very jealous Prince puts the Princess under a horrible magical spell. Frightened for her mother's safety Princess Melody runs away. The evil Prince leaves Wet Springs and destroys his new found land. Magical fairies are called upon. Can the spell be broken and will the Queen, Princess and Fairyland be saved? Description: A children’s enchanting fairy tale book. You can purchase this book from Amazon and download the songs. These books are available for sale at wholesale prices in bulk. There were only 3,000 copies printed, less than that are available for sale due to storage problems. Contact by post only! Note. Buterfly Lullaby is a rare limited edition book which has been advertised used for up to £60.00. Description: Butterfly Lullaby album full of fairy songs for the Butterfly Lullaby fairy story. You can purchased this album on Itunes or Amazon. Songs include: Main original song Butterfly Lullaby, Wishing Well Song, Dance like a butterfly, Colour me, and many more. See home page to view song videos. The Butterfly Lullaby song is sung by the King Butterfly fairy. 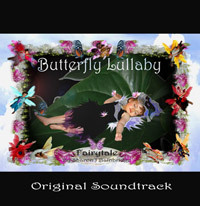 You can Listen to the Main song from Butterfly lullaby free at: http://www.isound.com/jakson_lee or go to Itunes/Amazon. The character Sunset Bunny is based on Jodie, Sharon’s cousin’s little girl who has Cystic Fibrosis. Sharon has given her character, Sunset Bunny, to the Cystic Fibrosis Trust. She has created a Sunset Bunny the Easter Fairy Story, which will hopefully be available on Itunes shortly. 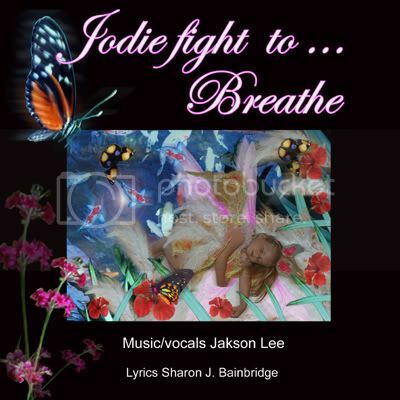 The song Jodie fight to breathe was written by Sharon and recorded/produced by singer Jakson Lee. They hope this song will also raise much needed money for a Cystic Fibrosis cure. The song Jodie fight to breathe is now on Amazon and Itunes. As Sharon is giving away the Sunset Bunny the Easter Fairy story and song for Jodie she hopes to find a very rich buyer for the original OOAK Sunset Bunny the Easter Fairy dress to get Jodie to Disney. Jodie is now wheelchair bound as she cannot breath properly. This fairy dress/costume is a complete one off (OOAK,) no patterns were used. It was handmade and hand painted by Sharon J Bainbridge and used for the fairy book by the Sunset Bunny character for the Buttefly Lullaby book launch. You can view the fairy dress and part of the Easter Story in the video below. Visit www.cftrust.org.uk to help raise money. Butterfly Lullaby gives you a chance to visit real places that were used in the story - the tropical gardens of Plantasia, Swansea, Castell Coch, Cardiff and the Upwey Wishing Well, Weymouth. See the Wishing Well video on the home page.